Top 500 LIVE! 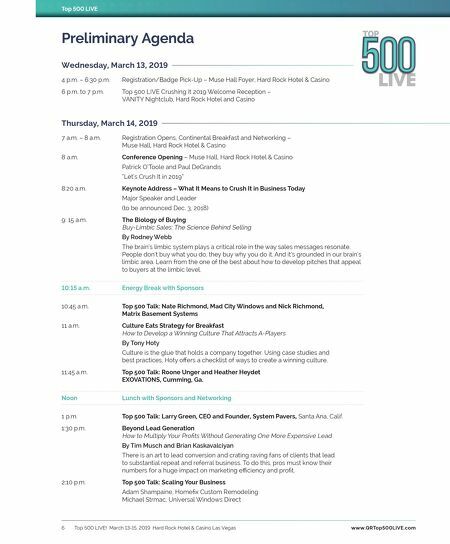 March 13-15, 2019 Hard Rock Hotel & Casino Las Vegas 7 www.QRTop500LIVE.com Top 500 LIVE 2:40 p.m. Energy Break with Sponsors 3:10 p.m. How Are You Crushing It in 2019? CEO Panel Discussion and Audience Participation Larry Green, Adam Shampaine, Michael Strmac, Roone Unger and Heather Heydet 4 p.m. How to Sell Profitable Jobs Panel Discussion by Leading Members of Certified Contractors Network Scott Siegal with D.J. 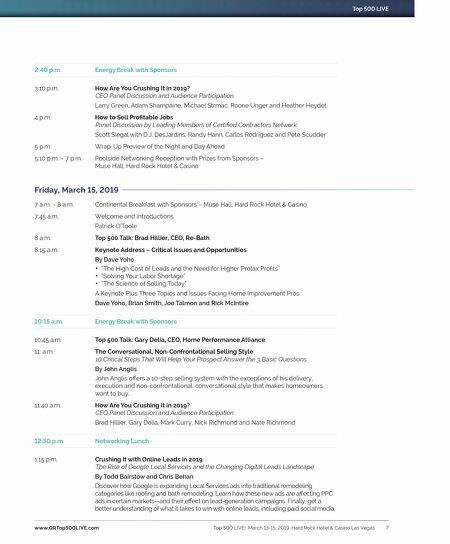 DesJardins, Randy Hann, Carlos Rodriguez and Pete Scudder 5 p.m. Wrap-Up Preview of the Night and Day Ahead 5:10 p.m. – 7 p.m. Poolside Networking Reception with Prizes from Sponsors – Muse Hall, Hard Rock Hotel & Casino Friday, March 15, 2019 7 a.m. – 8 a.m. Continental Breakfast with Sponsors – Muse Hall, Hard Rock Hotel & Casino 7:45 a.m. Welcome and Introductions Patrick O'Toole 8 a.m. Top 500 Talk: Brad Hillier, CEO, Re-Bath 8:15 a.m. Keynote Address – Critical Issues and Opportunities By Dave Yoho • "The High Cost of Leads and the Need for Higher Pretax Profits" • "Solving Your Labor Shortage" • "The Science of Selling Today" A Keynote Plus Three Topics and Issues Facing Home Improvement Pros Dave Yoho, Brian Smith, Joe Talmon and Rick McIntire 10:15 a.m. Energy Break with Sponsors 10:45 a.m. Top 500 Talk: Gary Delia, CEO, Home Performance Alliance 11: a.m. The Conversational, Non-Confrontational Selling Style 10 Critical Steps That Will Help Your Prospect Answer the 3 Basic Questions By John Anglis John Anglis offers a 10-step selling system with the exceptions of his delivery, execution and non-confrontational, conversational style that makes homeowners want to buy. 11:40 a.m. How Are You Crushing It in 2019? CEO Panel Discussion and Audience Participation Brad Hillier, Gary Delia, Mark Curry, Nick Richmond and Nate Richmond 12:30 p.m. Networking Lunch 1:15 p.m. Crushing It with Online Leads in 2019 The Rise of Google Local Services and the Changing Digital Leads Landscape By Todd Bairstow and Chris Behan Discover how Google is expanding Local Services ads into traditional remodeling categories like roofing and bath remodeling. Learn how these new ads are affecting PPC ads in certain markets—and their effect on lead-generation campaigns. Finally, get a better understanding of what it takes to win with online leads, including paid social media.